Before our final performance of Viva la Mamma! 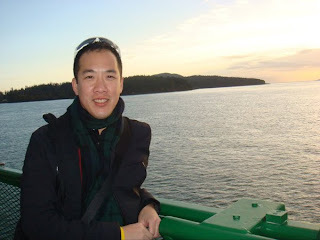 tonight in downtown Seattle, in the Nordstrom Recital Hall at Benaroya Hall, we have a chance to chat with Kelly Kuo (pictured left en route to the San Juan Islands), coach/accompanist with the Young Artists Program and pianist at these performances. Kelly, you’ve been living and performing in musical meccas around the US for several years: New York City, Houston, Cincinnati, Seattle, southern California. But you’re a son of the Pacific Northwest, and just returned from Walla Walla, WA, not far from where you grew up. What was it like to go back there now? Having made my piano soloist debut with the Walla Walla Symphony when I was in the 3rd grade, it felt like I had come full circle with my return to the desert of eastern Washington. Since it has been about 20 years since I last performed in the area, I was happy to have friends and family from my hometown, Hermiston, Oregon, at the show to cheer me on. You’ve worked with Seattle Opera on Verdi and Wagner (the Ring, ’09, and Falstaff, ’10), on new music (The End of the Affair, ’05) and now on this more old-fashioned opera, Viva la Mamma! Which production has been the most rewarding? Taking on the Ring in 2009 was the most rewarding because it was my first time working on a full-scale Wagner production. Do you prefer working on new music or old music? The thing I really enjoy about working with new music is the process of collaborating with a living composer directly. More often than not, it has been a liberating and rewarding experience for me so, if forced to choose between new and old, I would cast my vote for new. Since you’re visible onstage the whole time, the stage director of Viva la Mamma!, Jeff Buchman, worked you into the show a little bit. What performing experience do you have beyond playing the piano? Is it fun to be a character in the show, as it were? When I was a student at the Manhattan School of Music, I was a member of a "Music-Telling" ensemble modeled after a performing group named "Tales and Scales." We were a quartet of musicians who acted and performed music composed specifically for a script and story created by the group members ourselves and where the only props we could use were our instruments. My fond memories of performing in the NYC public schools with that group remind me of what I'm doing now in Viva la Mamma!. 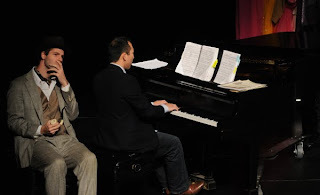 It is also tremendous fun, as the continuo player, being the "thought bubbles" of the other performers on stage. With this production of Viva la Mamma!, you are coach/accompanist (and, really, the entire orchestra). But you also have experience working in opera as Artistic Administrator and Conductor. What’s the hardest part of each of those jobs? 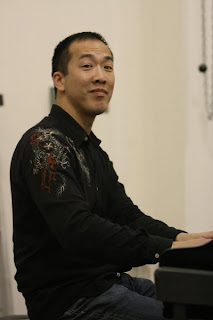 The job of pianist/coach is usually centered around realizing the musical interpretation of the conductor and helping the singers sound their best when negotiating the terrain associated with this interpretation. One always hopes to bring something to the table as a musician, but, in the end, it is still someone else's interpretation, which can be hard to deal with--especially when one is not entirely convinced by another person's interpretation or lack thereof. The role of Artistic Administrator differs in every opera company but I find a common theme that resonates among all AA's is that of balancing the needs of singers (higher fees) with those of the company (lower fees) while getting the best voices possible within budget limitations. When one conducts opera, there is usually very limited time to work with the orchestra, but this is the time when the conductor really learns the craft. While every other person in the pit and on stage gets to practice with his/her instrument at all times, the conductor is challenged by having far less time to work with his instrument, the orchestra, and foster a situation where everyone involved collaborating and able to perform at their best. Though there are rewarding aspects of each position, I'd have to stick with conducting as my favorite. You did your training with the Houston Grand Opera, and are now training young singers with Seattle Opera. Tell us about some of the rewards and challenges of Young Artists Programs, then and now. As a bridge between the academic and professional worlds, Young Artist Programs can give participants the tools and opportunities to make the transition smoothly by covering principal roles or performing small roles next to more experienced colleagues. It's a win-win situation for both the company and young singers. But because of the necessity of finding more refined singers who are able to step into these responsibilities immediately, it is often difficult for programs to invest in and nurture singers who may have an important talent but aren't ready to perform at a high level yet.